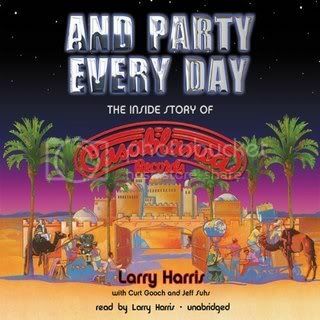 And Party Every Day: The Inside Story Of Casablanca Records is now available as an audiobook from Blackstone Audio. Read by author and former Vice President of Casablanca Records, Larry Harris, the unabridged recording runs nearly 11 hours and details the behind-the-scenes exploits of the infamous 1970s label that was home to KISS, ANGEL, PARLIAMENT/FUNKADELIC, DONNA SUMMER and the VILLAGE PEOPLE. A sample can be heard here. The And Party Every Day audiobook has been released in five different formats: 1) a single-disc Mp3 format CD; 2) a nine-disc CD boxed set; 3) a plugin flashdrive/playaway version; and 4) an Audible digital download, and 5) a library-folder pressing on nine cassettes. Now it can be told! The true story of Casablanca Records, from an eyewitness to the excess and insanity. Casablanca was not a product of the 1970s, it was the 1970s. From 1974 to 1980, the landscape of American culture was a banquet of hedonism and self-indulgence, and no person or company in that era was more emblematic of the times than Casablanca Records and its magnetic founder, Neil Bogart. From his daring first signing of KISS, through the discovery and superstardom of Donna Summer, Village People, and funk master George Clinton and his circus of freaks - Parliament/Funkadelic - to the descent into the manic world of disco, this book charts Bogart's meteoric success and eventual collapse under the weight of uncontrolled ego and hype. It is a compelling tale of ambition, greed, excess, and some of the era's biggest music acts.